Nestled in a townhouse built in 1852, once residence of Duke of Morny, Taillevent restaurant is an institution - a reputated table in the Champs Elysees district : A cosy interior and a comfortable dining room, one of the greatest wine list of the city (The restaurant is said to own a treasure of about 800.000 bottles of wine...) and a cuisine of exception orchestrated by Chef Alain Soliveres… An unceasingly renewed tradition and a continual search for perfection. Please note that the information about Taillevent restaurant was accurate when it was published, but can change without notice - Please check with the restaurant the accuracy. Some of the world's finest cuisine can be found in Paris. 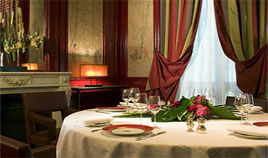 We have listed the best places to dine in Paris : Be sure you hit the best restaurants or the best bargains for food while you are there. Paris cafes are possibly the most well-known image of the City of Light.